Yesterday I had the privilege of attending a tribute luncheon for Clendon Thomas, the 1957 Oklahoma All-American football player who will be inducted into the College Football Hall of Fame this December. The Petroleum Club in downtown Oklahoma City was packed with people who came to honor Clendon's accomplishments, but more importantly, to honor his character and humility. The Daily Oklahoman did a great job this morning reporting on the event. I knew Clendon and his lovely wife before the luncheon, even attending OU football games with them courtesy of my friend Jakie Sandefer. 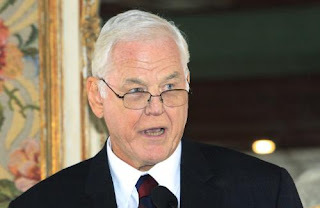 However, I was deeply impressed by an event that closed out the luncheon You could tell Clendon was unconfortable throughout the tribute with all the attention. Clendon was so popular during his playing days that some Oklahoma fans even named their sons after him, and he remains unaffected by such attention, even to this day. However, the only time Clendon became emotional was at the end. I sat where I had an unobstructed view of Clendon as Chuck Bowman, Director of Oklahoma's Fellowship of Christian Athletes and former roommate of Clendon at OU, read a poem. I saw on Clendon's face his heartfelt belief this poem represented his beliefs. A little background on the poem is warranted. Mickey Mantle came to faith in Jesus Christ two weeks prior to his death in 1995. His longtime friend, Yankee second baseman Bobby Richardson, had long prayed for Mickey Mantle's conversion to Christianity. At Mantle's euology, Bobby Richardson read the poem that Chuck Bowman read at the Clendon's tribute yesterday. For two of Oklahoma's greatest athletes, one of whom has served Christ all his life (Clendon Thomas), and the other who came to know Christ just two weeks before his death (Mickey Mantle), this poem has proved very meaningful. For me, it is a creative reminder that real and lasting meaning in life comes from our relationship with God through faith in His Son. That no-one knows your name! And every man made star. How long will your fame last? Proud, you’ll find your name. And write me in His book. Everytime I drive south on Highway 81 from my home in Enid, Oklahoma on my way to Oklahoma City, I pass by a big casino in what is now Concho, Oklahoma. Thousands of people in my state know about the casino called Lucky Star, but very few people inside or outside of Oklahoma know about the extraordinary events that occurred three miles south of Lucky Star on the banks of North Canadian River on April 6, 1875 or the subsequent story of personal redemption (see above quote) that was told six years later on June 19, 1881 in the school house immediately west of Lucky Star. The story of David Pendleton will require a little background, but if you patiently and carefully digest the history, you will understand the significance these events have on U.S. history. The story of Okuhhatuh's conversion to Christ has some startling connections to U.S. federal labor laws, the Star Spangled Banner, and the National Football League. I live in Garfield County, Oklahoma, a county named after U.S. President James Garfield. On July 2, 1881, President Garfield, accompanied by Robert Todd Lincoln (Abraham Lincoln's son), made his way to a train station in Washington, D.C. in order to catch a train to Massachussetts where the President would be giving a speech. As President Garfield and Mr. Lincoln walked through the Sixth Street Station in Washington, assassin Charles J. Guiteau shot the President in the back. Guiteau, who had campaigned for Garfield's election, had applied for federal office and was angered that the President had denied him a job. 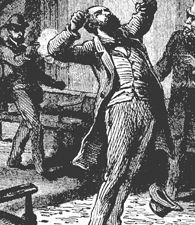 Armed with a .44 caliber pistol, Guiteau mortally wounded Garfield. The President would eventually die from his wounds on September 19, 1881. Most people know of Garfield's assassination, but few know of the historic aftermath. Ohio Senator George Pendleton was a friend of President Garfield. They both hailed from Ohio and had been close for decades. Senator Pendleton, upset by the assassination of the President by a disgruntled federal office seeker, authored legislation that eventually became known as the Pendleton Civil Service Reform Act of 1883. If you have ever taken a test for a federal job or held a position within the federal government, you are familiar with Pendleton's Act. It provided selection of government employees based upon competitive exams rather than ties to politicians or political affiliation, reversing the federal patronage system which had been in place prior to the act. Pendleton's law also made it illegal to fire or demote government employees for political reasons.To enforce the merit system, the act also created the United States Civil Service Commission. Pendleton, called by those who knew him "Gentleman George" for his gentle demeanor and Christian principles, is best known for three things: (a). The Pendelton Act, (b). His long and happy marriage to Alice Key, daughter Francis Scott Key, the author of "The Star Spangled Banner" and (c). Pendleton, Oregon, a city named in his honor. Senator George Pendleton and his wife Alice Key Pendleton, however, should be known for something even more signficant. This Christian couple led a Cheyenne warrior named Okuhhatuh to faith in Christ while visiting him in prison in Florida. Okuhhatuh had lived the first thirty years of his life roaming the western plains of Oklahoma as a Cheyenne warrior. How Okuhhatuh wound up in the prison in Florida is a story of God's providence and mercy in the life of an Indan man God chose to redeem. Less than sixty miles south of where I live in Garfield County is the historic Darlington Indian Agency. Located on the north bank of the North Canadian River, precisely where the old Chisolm Trail (Fort Sill Military Road) crosses that river, Darlington was established in the spring of 1870 and served as the government base for the Cheyenne and Arapahoe Indian Reservation. The United States 6th and 10th Cavalry also used Darlington as one of their Indian Territory posts in the 1870's. 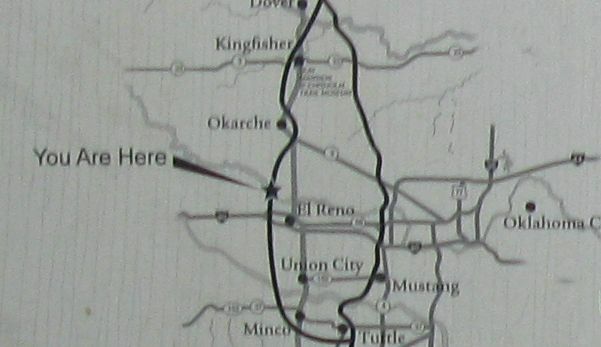 Darlington is two miles north and two miles west of what is now the city of El Reno, Oklahoma. What happened at the Darlington Indian Agency on April 6, 1875 directly resulted in the establishment three months later of U.S. Fort Reno (est. July 1875), a fort built directly south of Darlington, just across the North Canadian River. Fort Reno was created to assist the government in putting down "The Cheyenne Rising." The origin of the phrase "God willing and the Creek don't rise" has nothing to do with flooding, but rather, with the knowledge that if "God wills" and the Creek Indians don't rise up and fight, then future plans are certain. ﻿In 1875 it wasn't the Creek rising, but rather the Cheyenne, the Comanche, the Kiowa, and other Plainsmen Indians as they revolted against government efforts to force them to live on Indian reservations within Indian Territory (Oklahoma). The plains were filled with uncertainty that comes with war. On April 6, 1875, several Cheyenne warriors found themselves prisoners at Darlington, courtesy of the United States cavalry. 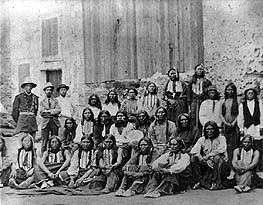 These Cheyenne warriors had been captured and arrested by United States troops for their armed resistance over being forcibly settled on a Cheyenne reservation. 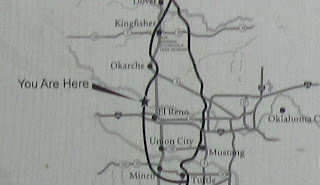 The Cheyenne reservation is located at present day Concho, Oklahoma, just north of Darlington Indian Agency. The Cheyenne warriors had been joined in the fight with whites by other Plainsmen Indian tribes (Comanche, Kiowa, Caddo, etc...) who were also being forced by the U.S. government to live on their respective tribal reservations within Indian Territory. 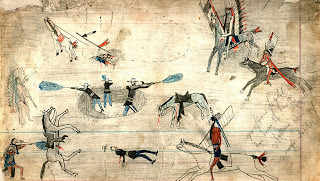 This 1874-1875 Indian war, called the Red River War, began with the an Indian attack on white buffalo hunters at the Second Battle of Adobe Walls in the Texas Panhandle on June 27, 1874, continued with dozens of major battles and minor skirmishes between Indians and whites which included the brutal slaying of white merchant Pat Hennessey on July 3, 1974 near the town that bears his name (Hennessey, Oklahoma), and would only end when Quanah Parker's Comanche warriors turned themselves in to U.S. troops at Fort Sill (Oklahoma) on June 2, 1875, just under a year after the Red River War began. The Cheyenne warriors who stood shackled before Sixth Cavalry Commander Lt. Colonel Thomas H. Neil that Tuesday afternoon, April 6, 1875 were waiting to be loaded on wagons for their transfer to the federal penitentiary at Fort Marion in St. Augustine, Florida. Black Horse, one of the last prisoners to be shackled, overpowered the blacksmith attempting to rivet iron leglets on him. 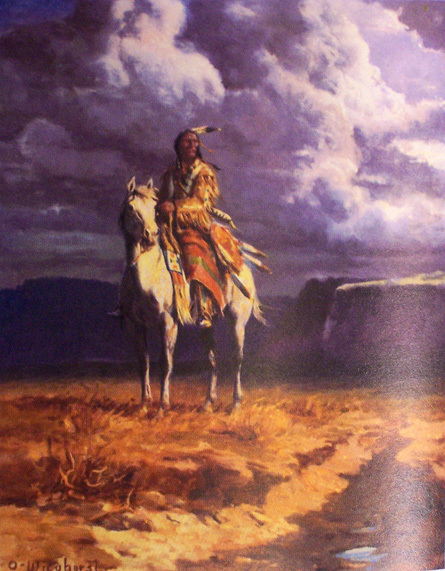 The Cheyenne warrior broke free from his captors and ran in an attempt to escape. At first the soldiers tried to chase down and capture Black Horse without shooting him. But as the pursuit lengthened and the cavalrymen realized that Black Horse would soon be able to cross the North Canadian and enter a Cheyenne war camp, they fired their guns at Black Horse. Other Cheyenne Indians, encamped around Darlington but not in custody, responded to the gunfire by attacking Blackhorse's pursuers. Cavalrymen from the 6th and 10th U.S. Cavalry were wounded in this Indian attack and infantry reinforcements were called as the battle grew intense. This April 6, 1875 Red River War battle took place just north of what is now the city of El Reno, Oklahoma all along the North Canadian River, and is considered the last major battle of the Red River War. It also marks the first time a Gatling Gun was used by the U.S.military against Indians in the Southwest. 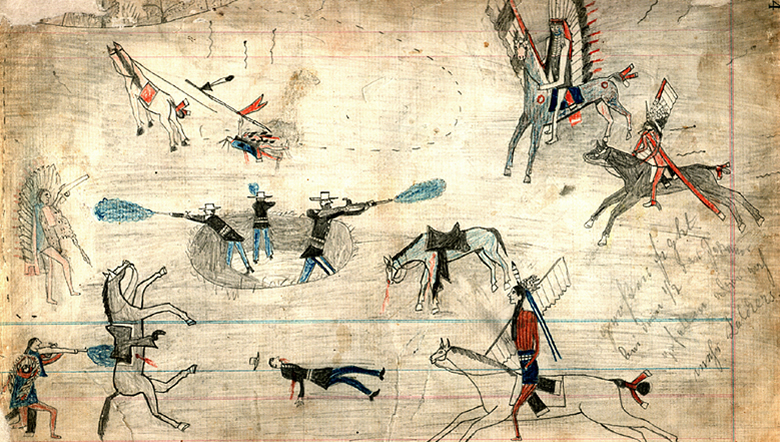 Black Horse and several other Cheyenne Indians were killed during the battle. Listening to the gunfire around him while under arrest and shackled with iron leglets in the jail at Darlington was a Cheyenne warrior Indian named Okuhhatuh. He was thirty years old and stood over six feet tall. His eyes had the cold, hard stare of a hardened Cheyenne warrior. His name loosely translates into English as "Sun Dancer" or "Making Medicine." The Cheyenne word for 'medicine' referred to supernatural powers both during and after combat. Okuhhatuh possessed great fighting skills and had demonstrated such during the major battles of the Red River War. He had distinguished himself as an accomplished and powerful warrior, leading his fellow Cheyenne into battle. His activities had led to his eventual capture and arrest by the United States cavalry troops who had been assigned to put down the Indian's insurrection. Okuhhatuh's anger stirred as he struggled against the bonds that kept him imprisoned and unable to enter the battle going on around him. Little did Okuhhatuh know that just a few years later he would return to Darlington with a changed heart and a new name. The Cheyenne Warriors Become the "Florida Boys"
After the U.S. soldiers quelled the April 6, 1875 Cheyenne uprising in the sandhills around Darlington with the use of their Gatling Gun, the soldiers turned their attention to safely transferring Okuhhatuh and 71 other imprisoned Indian warriors, 33 of whom were Cheyenne, to Fort Marion in Florida. Now properly shackled, the Indians were loaded onto transport wagons and taken to Fort Leavenworth, Kansas. Boarding trains at Fort Leavenworth while guarded by U.S. soldiers, Okuhhatuh and his fellow prisoners then took their first ever train ride through St. Louis, Louisville, Nashville, Atlanta, Macon, finally disembarking at Jacksonville, Florida. From Jacksonville the Indian prisoners were taken by steamboat to Tocoi, Florida and then by railway 20 miles to Fort Marion, arriving at the Fort in late April of 1875. Fort Marion was constructed in the late 1600's and is the oldest stone fort in the United States. Located in the St. Augustine, Florida (est. 1565), Marion was constructed by the Spanish to protect Spain's sea lanes in the New World. Originally called Castillo de San Marcos, the Castillo was renamed Fort Marion after Florida became United States Territory. It served as a United States Army Post in 1875 as well as a Federal Penitentiary. Captain Richard Henry Pratt became the Commander of Fort Marion when Okuhattuh and his fellow warriors arrived in 1875. He had traveled with the Indians from Indian Territory (Oklahoma), having been stationed there with the U.S. Army, but rather than returning after delivering the captives, the government made him the commander of Fort Marion. Captain Pratt was a political progressive as well as a devout Christian. He believed, contrary to his commanders, that Indians should be redeemed and educated, not exterminated. Pratt's commander, Civil War hero General Philip Sherman told Pratt that his prisoners were “unmitigated murders of men, women, and children without a single particle of provocation.” Pratt, however, had great deal of respect and deep compassion for his Indian prisoners. 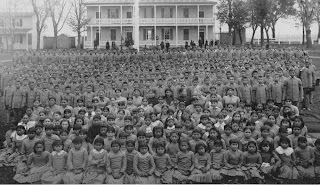 He treated them as fellow human beings and spent the next three years doing everything within his power to educate, teach and "convert to Christ," the Indians under his charge. He would later say, "In Indian civilization I am a Baptist, because I believe in immersing the Indians in our civilization and when we get them under holding them there until they are thoroughly soaked." His efforts included teaching the prisoners English in order to read the Bible, treating them daily with dignity and respect, helping them start a local small business outside the prison, allowing them to attend church services in St. Augustine on Sundays, and the freedom to interact with citizens who wished to build friendships with the Indian warriors. It was not long after Pratt arrived in St. Augustine that word began to spread these Plains Indians were not "savages" but real human beings. His grand experiment proved a success, with not one Indian, including Okuhhatuh, ever attempting to escape. Many of the Indians converted to faith in Christ. Pratt's methods would be deemed politically incorrect and totally unacceptable by today's standards. His motto was "Kill the Indian, save the man." In the summer of 1875 George Pendleton was President of the Kentucky Central Railroad. He would become a United States Senator in 1879, but in the summer of 75 this wealthy Christian businessman from Ohio traveled with his wife, Alice Key Pendleton, and his daughter Jeanie to St. Augustine, Florida for vacation. Touring Fort Marion (a tourist attraction even then), the Pendleton's became acquainted with the efforts of Captain Pratt to lead his Indian captives to Christ. The Pendleton's were introduced to the tall, Cheyenne warrior named Okuhhatuh, and a bond was instantly formed between the Pendleton's and Okuhhatuh. The Indian could understand English more than he could speak it, so the Pendleton's spent several days of their vacation visiting the Cheyenne warrior, explaining to him the hope they had in the gospel of Jesus Christ. In return, Okuhhatuh gave the Pendleton's daughter, Jeanie, some books of his Indian drawings he had done in prison. Sometime during the Pendletons visits with Okuhhatuh, the Cheyenne warrior gave his heart to Christ. "Christian name give me. I am very well. Dear Jesus. God gives me good head, good heart, good speak. good everything. Every day my heart so glad. A long time my name "Okuhhatuh". Now my Xn name David Pendleton. Every day I am very well. My heart so glad. Oh I hope just the same you all will be very soon." A fast and lasting friendship was formed between Okuhhatuh and the Pendletons. 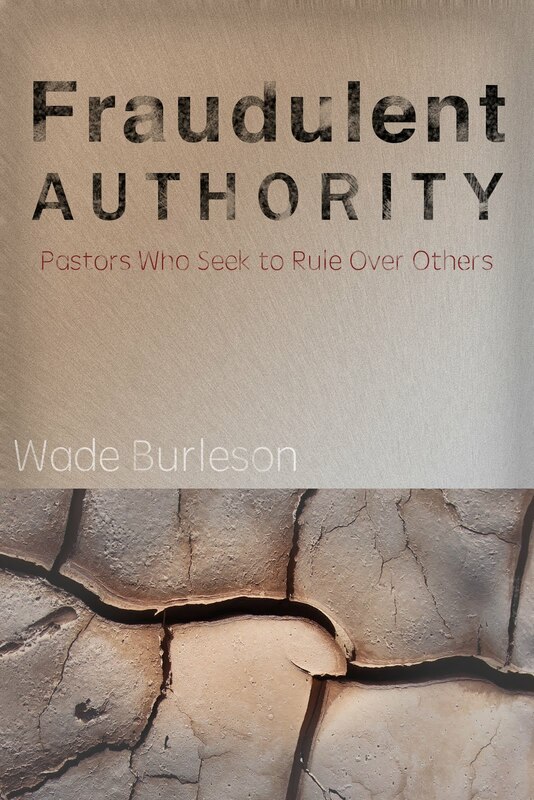 The Pendletons would make regular trips to Florida to assist and train the Indian whom they had led to faith in Christ, and who had taken their surname as his own. David eventually gave the Pendleton girls archery lessons, teaching them how to shoot an arrow from bow with accuracy. Some might say that it was cruel the way Okuhhatuh came to faith in Christ, but reading the letters of David Pendleton Oakerhater (the anglicized spelling of his name), one gets the impression that the greatest day in his life was the day he received Christ as his Lord. 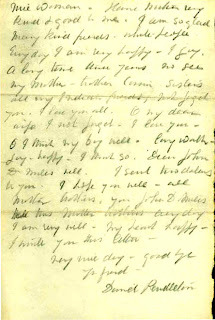 David writes in April 1879: "I sorry my Indians not know God not know Jesus not know Sunday not know everything." The passion David Pendleton showed for reading and learning the Christian faith, sharing with others the love of Christ, and desiring his fellow Indians to come to know Christ themselves surprised everyone who had once known David as the warrior Okuhhatuh. Upon being released from prison in Florida, David was sponsored by the Pendletons on a trip to New York where he received some further English education. David, however, was eager to return to Indian Territory. Captain Pratt, based upon his successful assimilation of the Cheyenne Indian warriors into white civilization while at Fort Marion, had been granted permission by the U.S. government to begin an Indian school called The Carlisle Indian Industrial School in Carlisle, Pennsylvania. 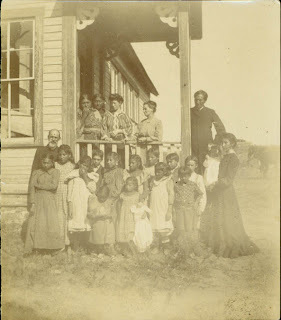 Captain Pratt desired David to go back to his home in Indian Territory, share Christ with his friends and family, and then return to Carlisle with a number of Cheyenne and Araphoe children to attend Carlisle Indian School in time for its opening in the fall of 1879. Carlisle would operate with the same principles under which David lived while at Fort Marion prison. The schools motto would be "To civilize the Indian, get him into civilization. To keep him civilized, let him stay." David agreed to the request and in September 1879 David Pendleton Oakerhater returned to Darlington for the first time since his removal in iron chains in April 1875, four and a half years earlier. 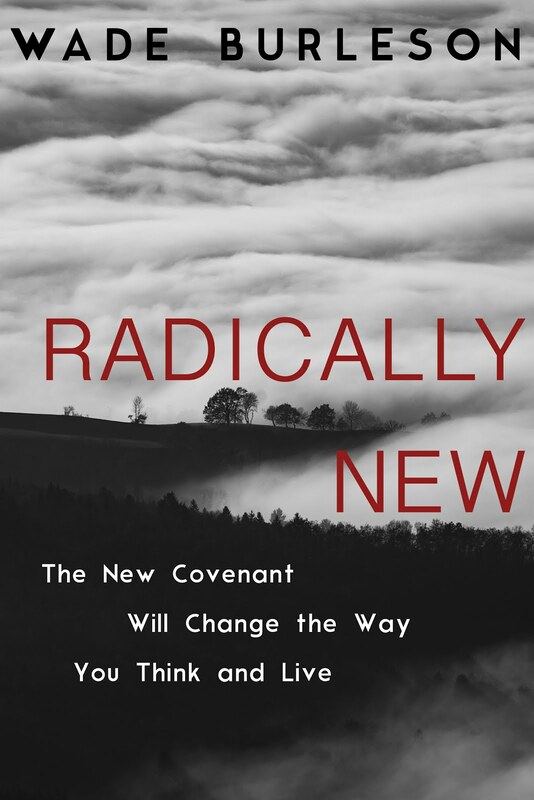 He had an emotional reunion with friends and family, and he shared with them "the new way" of faith in Christ. 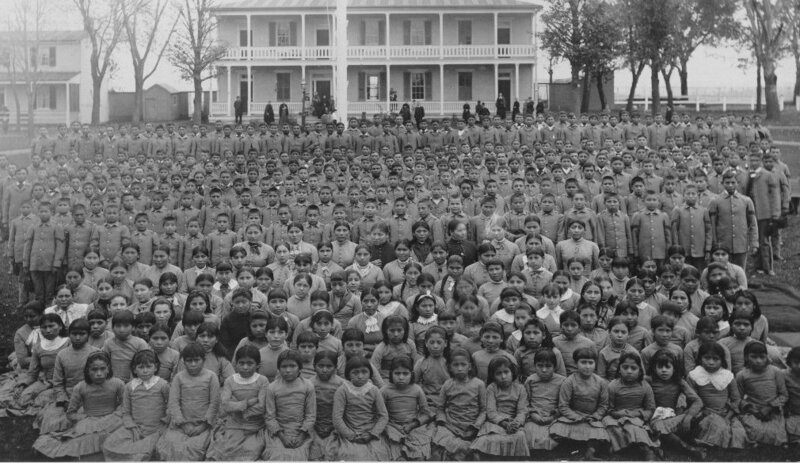 David only stayed a month in Darlington among his Cheyenne people, after which he brought with him twenty-nine Cheyenne and Arapahoe children to the newly opened Carlisle Indian School. 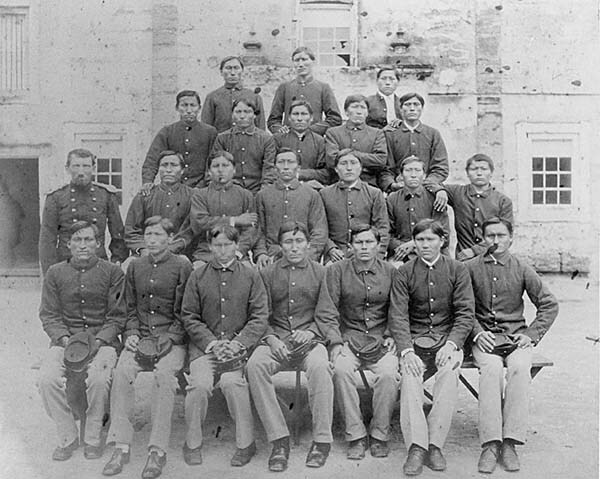 In the fall of 1879, Carlisle Indian School formed its first football team. Today, the Carlisle Indian School is known world-wide for Jim Thorpe and the 1911 football team called the Carlisle Indians. Jim Thorpe was its star athlete. He would later become a double Olympic gold medalist, as well as a professional baseball and football player, and is widely considered the world's greatest athlete. The coach of that team was "Pop" Warner (Glenn Scobey Warner), who started coaching at Carlisle Indian School when he was 28 years old. Pop Warner coached at Carlisle for two different periods, 1899–1903 and 1907-1914. Thorpe competed under him from 1907-1911. The Carlisle Indians' winning percentage of .647 still stands as the best of any college football team in history. 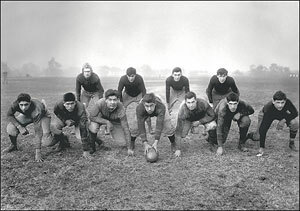 In her 2007 book about the Carlisle Indians, author Sally Jenkins characterized them as The Team that Invented Football, due to Pop Warner's innovations which were later adopted by the fledgling National Football League. "As irony would have it, at the time of Oakerhater's arrival in the Indian Territory the Cheyenne were in the midst of their Sun Dance celebration. Oakerhater was well aware of the Sun-Dance and its meaning. He understood the significance of the event and its importance to his people. He fully understood what the Missionaries were up against introducing the white man's “new road” at this particular moment in time." "Men, you know me. You remember me when I led you out to war. I went first, and what I told you was true. Now I have been away to the East, and I have learned about another captain, the Lord Jesus Christ, and he is my leader. He goes first, and all he tells me is true. I come back to my people to tell you to go with me now in this new road, a war that makes all for peace and where we never have only victory...﻿﻿"
David Pendleton Oakerhater, the former Cheyenne warrior known as Okuhhatuh, served among his Cheyenne people in Oklahoma as a Christian missionary for over fifty years. He performed the first Christian funeral among the Cheyenne in 1882, burying the son of Black Horse, the very Cheyenne warrior who had been shot and killed by U.S. troops at Darlington as he attempted to escape custody on April 6, 1875. David Pendleton had come full circle. Senator George Pendleton would later say that his belief in fair labor was strengthened by his observations of David Pendleton's abilities in spite of the white prejudices against the Indian. Captain Pratt founded Carlisle Indian School because he saw the effects of proper education on the poor Indian minorities, transforming men like David Pendleton Oakerhater. The daughter of the author of the Star Spangled Banner, Alice Key Pendleton, had a father who believed America was "the home of the free," and her bond of friendship with the Cheyenne prisoner was due to her belief that freedom should exist for all Americans, not just white Americans. David Pendleton Oakerhater died on August 31, 1931 of natural causes and is buried in Whirlwind Cemetery just west of Watonga, Oklahoma. Many Cheyenne graves in my part of the country are marked with crosses because of the influence and ministry of David Pendleton. I can't help think about David everytime I drive by the Lucky Star casino which marks the area of David's early life and ministry. David Pendleton wasn't lucky. He was graced. Graced to know people who lived by principles. Graced to know a God who can forgive sinners of every sin. 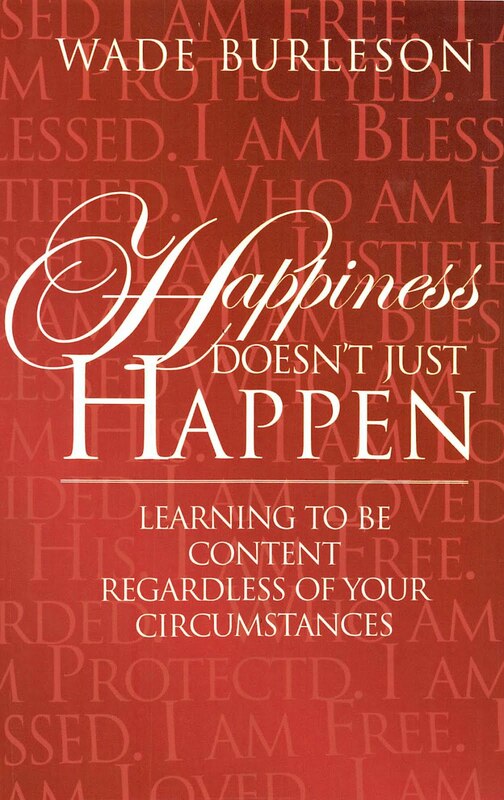 Graced to be a man who changed from the inside out. A member of the church I pastor sent me the math quiz below that spooked me with its amazing accuracy at picking my favorite movie from among eighteen greatest movies of all time. See if the math quiz works for you too. Be honest and don't scroll down to the list of eighteen feature films until you have done the math! You may be as amazed as I. Start by picking a number from 1 - 9.